Looking for Rosh Hashanah cards? Pear Tree Greetings has designs you’ll love to celebrate this new year with family and friends! 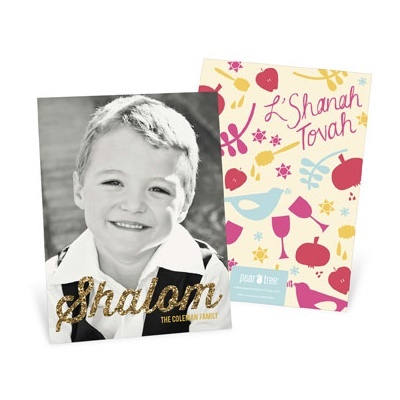 A holiday message of ‘Shalom’ sparkles on the front of these Rosh Hashanah cards, bringing a special touch to your favorite photo. The back features a colorful medley of meaningful symbols of the holiday, along with a L’Shanah Tovah greeting. Create stylish peace and harmony with the layout of these Jewish holiday cards. A trendy yellow background with subtle white dots creates an simple starting point. Add your favorite picture, personalized Jewish greeting and your choice of color for the text, and these cards will be cherished by family and friends. Make sure your Rosh Hashanah greeting cards are a cut above the rest. With a unique shape, these greetings will surely stand out. 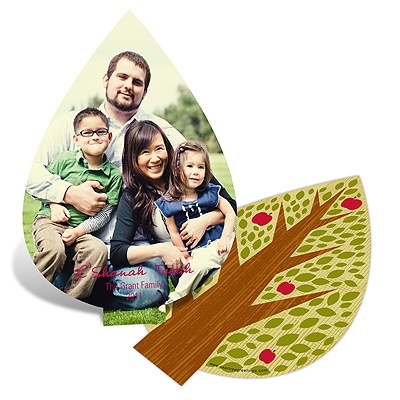 Add the meaningful element of the apple tree design along with your favorite picture, and your message will be remembered. 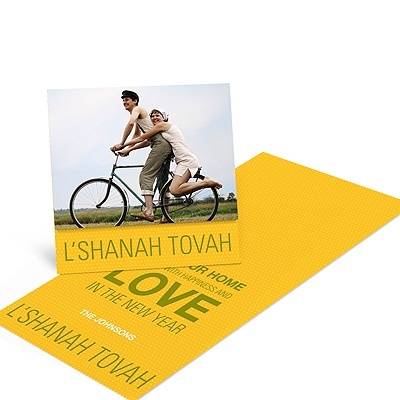 To see more designs of our Rosh Hashanah cards, visit our website and start personalizing your new year greeting!